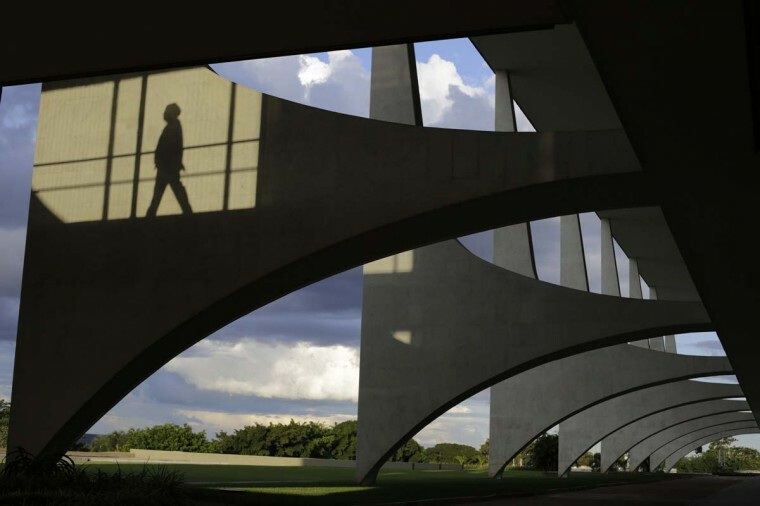 A shadow is cast April 2 at the Planalto Palace designed by architect Oscar Niemeyer in Brasilia. The futuristic capital city built from scratch on savannah ranch land in the middle of nowhere was meant to open up the interior of Brazil and symbolize its rise as an economic power. Fifty-five years later, Brasilia’s modern buildings designed by famed architect Oscar Niemeyer and laid out by urban planner Lucio Costa are still imposing, an open-air museum on UNESCO’s World Heritage list. Brasilia will host seven games during the 2014 World Cup soccer tournament. Picture taken April 2, 2014. 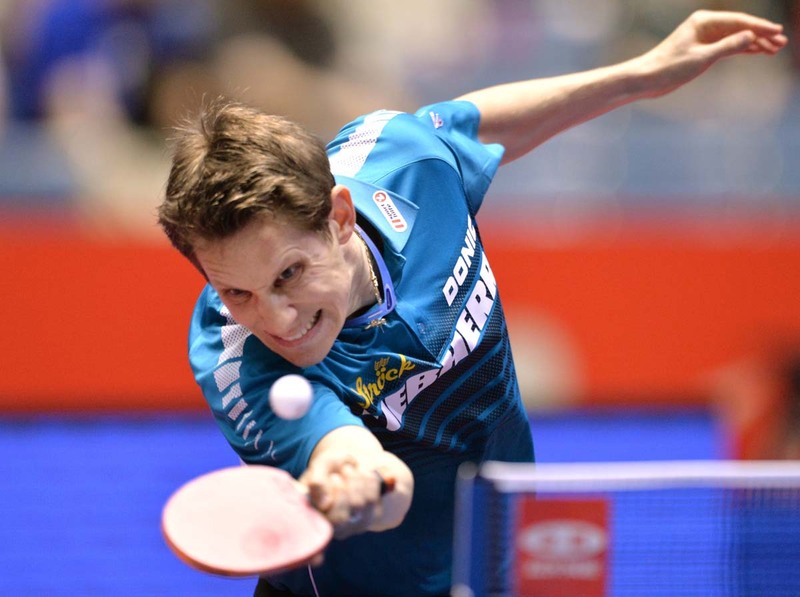 Austria’s Robert Gardos returns a shot against Kalinikos Kreanga of Greece during their match in the men’s team championship division knockout rounds at the 2014 World Team Table Tennis Championships in Tokyo on May 2, 2014. 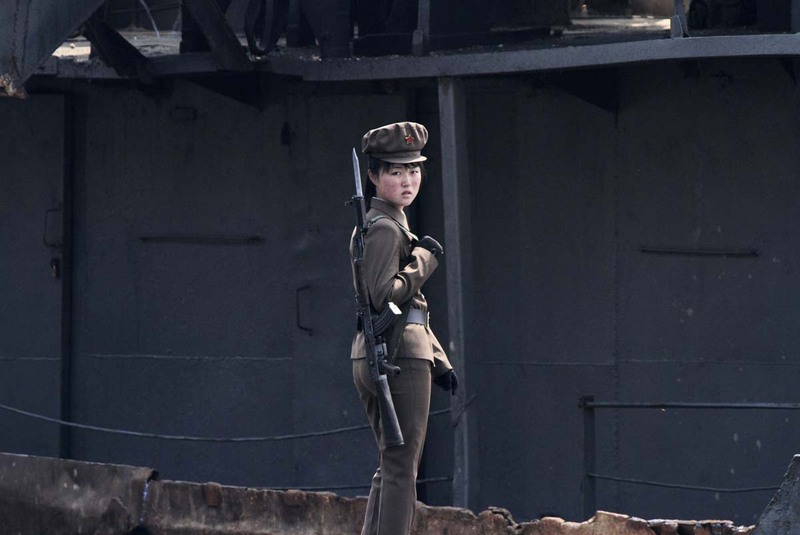 A North Korean soldier stands guard along the bank of Yalu River near the North Korean town of Sinuiju, opposite the Chinese border city of Dandong, May 1. 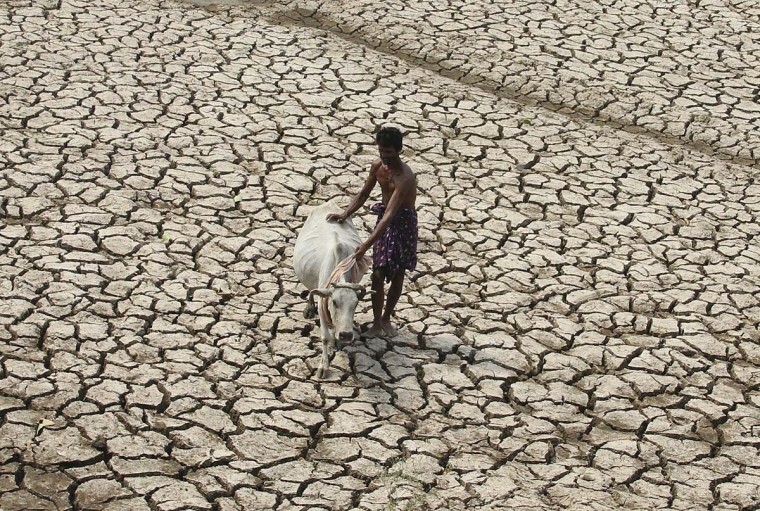 A villager along with his cow walks through a parched land of a dried pond on a hot day on the outskirts of Bhubaneswar in the eastern Indian state of Odisha on May 2. An Afghan miner poses for a photograph as he works at a coal mine which collapsed on April 30 killing some 40 miners and trapping an unknown number of others in the Dar-i- Suf district of Samangan province, some 200 kms from Mazar-e-Sharif on May 1. 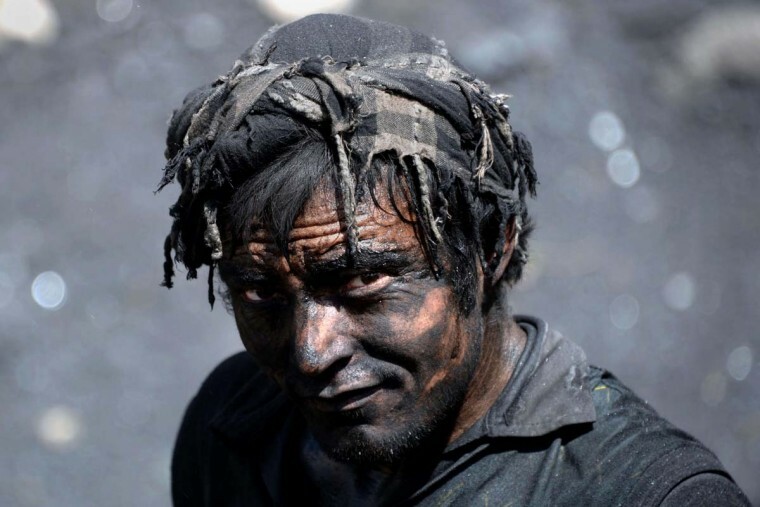 Officials at the site in Samangan province said an explosion inside the mine on April 30 killed some 40 miners and trapped an unknown number of others. 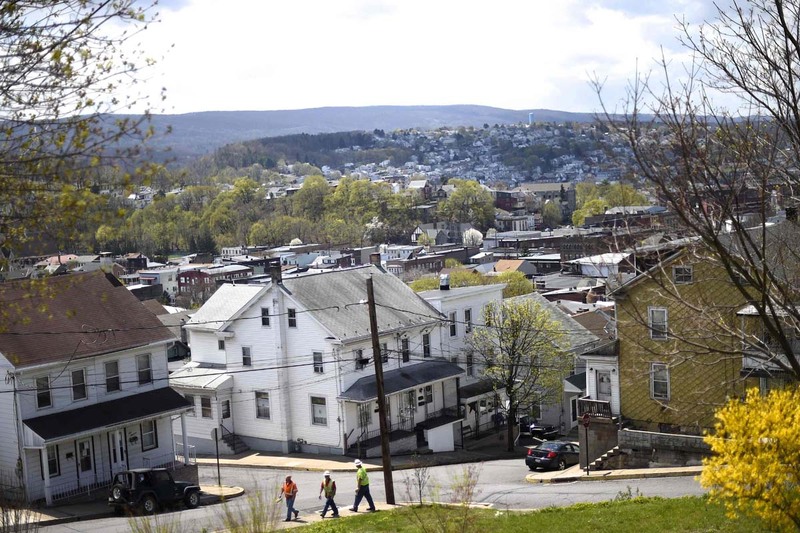 A telephone installation crew walks through the Bunker Hill area of Shamokin May 1, 2014. Shamokin, Pennsylvania, tucked away in the coal country about 120 miles northwest of Philadelphia, has $800,000 of unpaid bills and can’t get a loan from a bank. It is so broke, the gas service to city hall was temporarily cut off last month. So the council for the city of 7,000 residents has agreed to seek entry to a state financial oversight program dating from 1987 that facilitates access to credit and permits the levying of certain taxes. 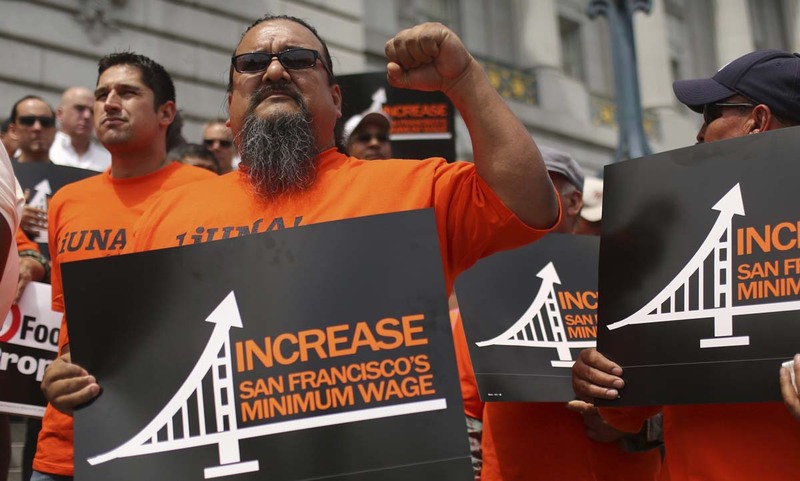 Workers gather at City Hall to listen to speeches during a May Day rally in San Francisco. Police in San Francisco and several other cities were accused by social media posters of using “kettling” techniques against May Day protests. The controversial technique involves surrounding often peaceful demonstrators with police and confining them in a small space without access to food, water or toilets, sometimes for hours at a time. “Kettling” operations can also prevent area residents from leaving their homes. 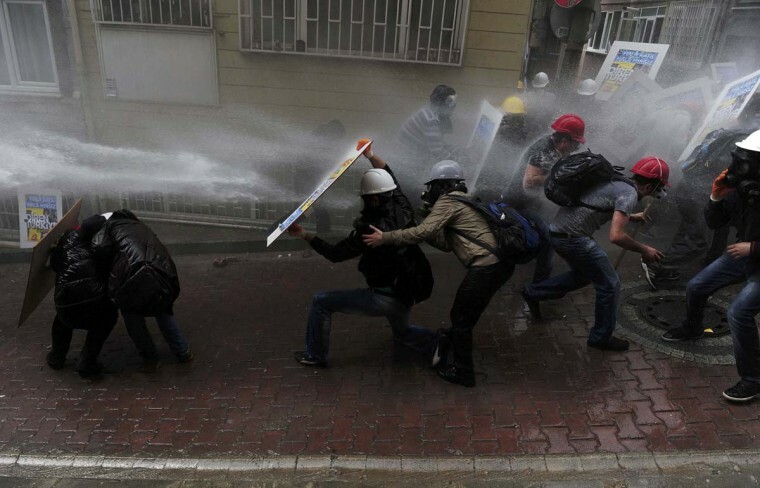 Protesters shield themselves as riot police use water cannon to disperse them during a May Day demonstration in Istanbul. Turkish police fired water cannon and tear gas on Thursday to prevent hundreds of protesters from defying a ban on May Day rallies and reaching Istanbul’s central Taksim Square, the focal point of weeks of protests last summer. 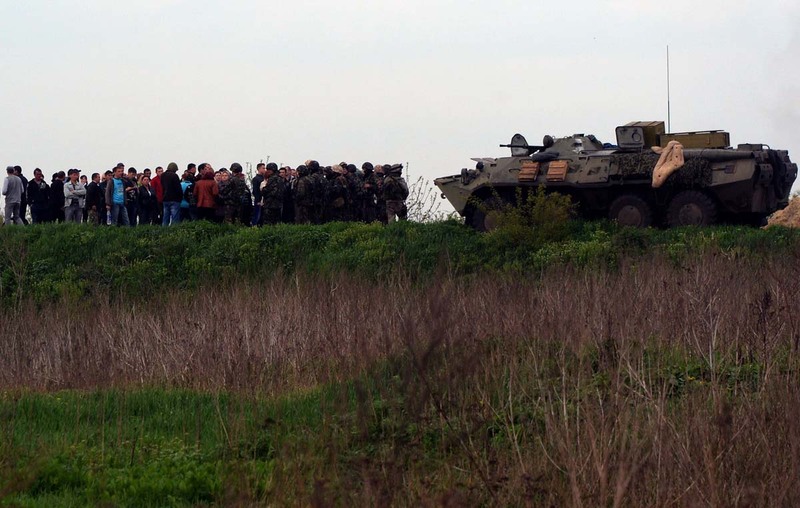 Residents gather to speak to Ukrainian soldiers at a checkpoint which they seized in the early morning in the village of Andreevka, 7 kms from the centre of the southern Ukrainian city of Slavyansk, on May 2. Ukraine’s military lost two helicopters and two servicemen on May 2 in a deadly offensive launched just before dawn against pro-Russian rebels holding the flashpoint town of Slavyansk, insurgents and authorities said. 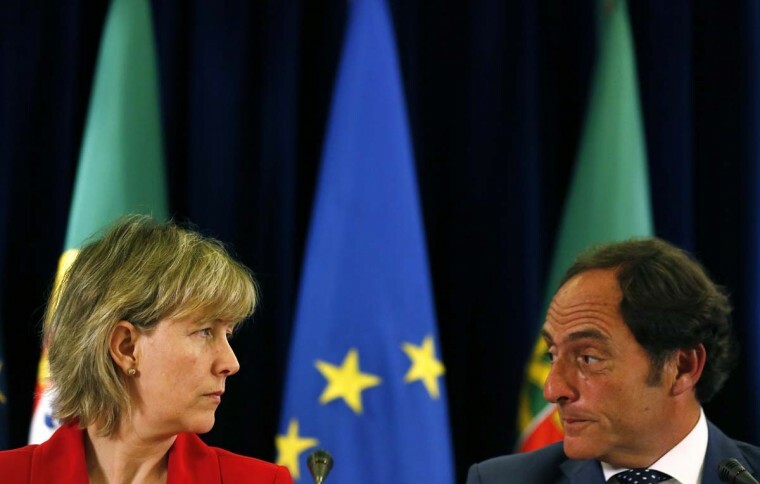 Portugal’s Deputy Prime Minister Paulo Portas (R) and Finance Minister Maria Luis Albuquerque attend a news conference in Lisbon May 2. Portugal has passed the last review of its economy by creditors under a bailout, setting it up for a smooth exit from the loan program later this month, the government said on Friday. 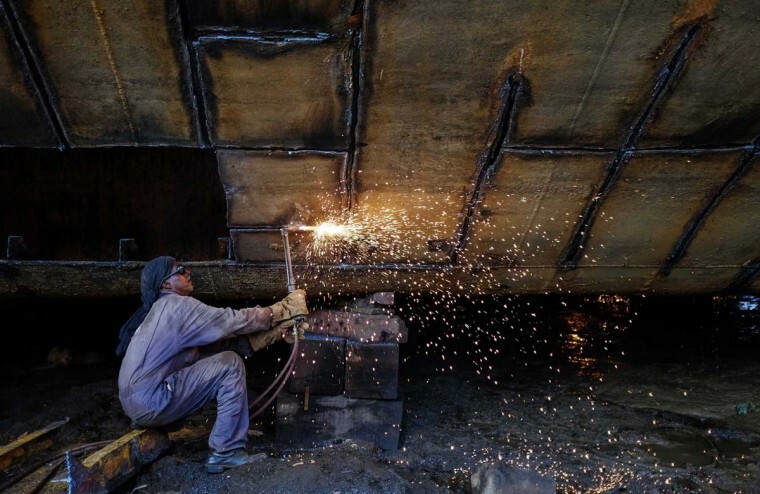 A worker repairs a vessel at a ship repair yard in Mumbai May 2. India’s factory growth showed no sign of acceleration last month as tepid demand restrained output even as price pressures eased, a business survey showed on Friday. 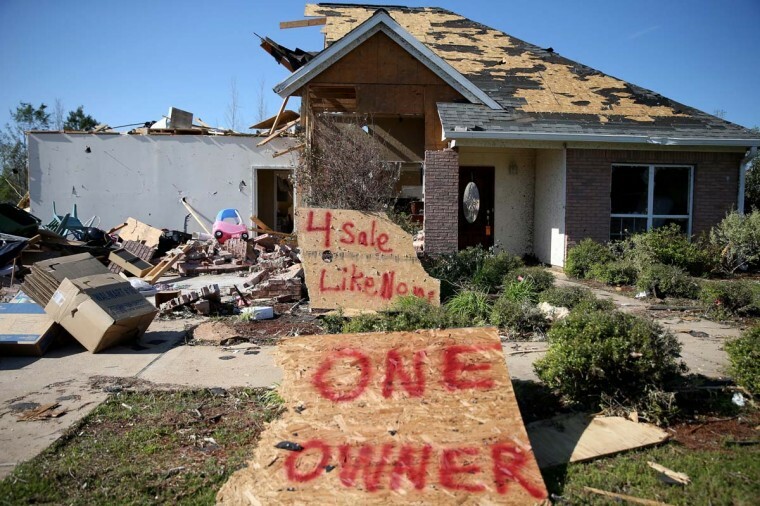 A sign reads, ” 4 sale Like New One Owner”, in front of a home that was damaged by the tornado that on Monday tore through town on May 1, 2014 in Louisville, Mississippi. A string of deadly tornadoes tore through the region beginning on April 27, leaving more than two dozen dead. 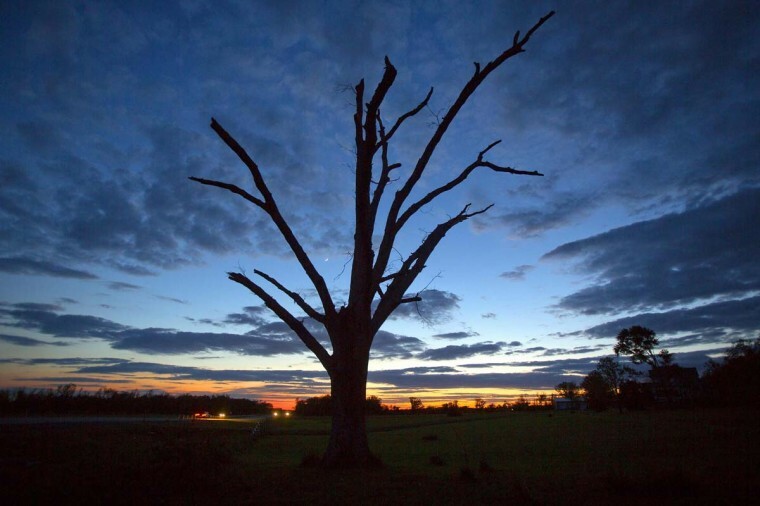 An oak tree that has lost all its leaves and most of its branches from a tornado is pictured at sunset near Vilonia, Arkansas May 1. Flood warnings were posted across the eastern United States on Thursday after a powerful storm system unleashed record amounts of rain from New England to Florida. The remnants of the storm that dumped up to 11 inches of rain in the Florida Panhandle on Wednesday had moved into the Atlantic Ocean by early Thursday, said Dan Petersen, a National Weather Service meteorologist.